If the methylation process does not work adequately then a number of symptoms results including: fatigue, depression, obsessive, compulsive and addictive type personalities, good tolerance of cold, poor tolerance of heat, unexplained nausea, poor pain tolerance, excess/abundant saliva in mouth, hyperactivity, frequent colds/flu, phobias, highly motivated and hard-driving personality, good creativity/imagination, high libido, joint pain/swelling/stiffness, excess perspiration and warm skin. Diasgnosis There is no simple direct test to sell how well the methylation process is working. Professor Pfeiffer, an expert in this field, considers basophil counts greater than 50 cells/cu mm and histamine levels greater than 70 ng/ml (0.629umol/L) a reliable diagnostic tool for diagnosing undermethylation. 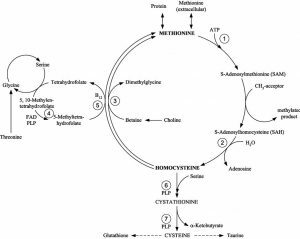 High homocysteine levels also indicate undermethylation. MTHFR gene mutations may also effect methylation rates so this is definitely also worth testing for. A histamine blood test and MTHFR gene blood spot test is available from us. Contact us for details. There is currently a number of treatments available for methylation problems. (1) The first treatment involves a combination of nutrients. These include: methylcobalamin (methyl-B12), methylfolate (5-MTHF) and pyridoxyl-5-phosphate (P5P). These are all available through our online store if you log into the members section of this website. If adding methyl B’s cause you to over methylate, taking time-released Niacin, 50 mg, or reducing the dose can slow it down. Symptoms of overmethylation can include muscle pain or headaches, fatigue, insomnia, irritability or anxiety. If you have inflammation taking 5-MTHF can make it worse so supplements such as curcumin and Krill oil may be necessary to help overcome the inflammation. A methyl donor such as Methionione, Trimethylglycine or SAMe should also be used however start with lower doses and ramp it up gradually to avoid overmethylating which can make things worse in some people. Glutathione may also be supplemented to help increase low levels. Again these are all available online through the members section of this website. (2) Protocols developed by Prof. Pfeiffer and Dr Walsh involves a methyl donor such as the amino acid methionine. In addition calcium helps release the bodies store of histamine, while Zinc aids the calcium-methionine program and provide sufficient relief. Typical treatment includes the following nutrients in high doses: calcium, magnesium, Vit B6, Vit C, zinc and methionine. Undermethylation induced depression suffers should avoid folic acid as it can further reduce serotonin levels even though it can assist with methylation. Manganese, copper, DMAE and choline may also worsen depression symptoms and thus should also be avoided in depressive cases. If undermethylators cooperate with treatment and works to give up detrimental addictions, the prognosis is good with improvement usually noted in 4-8 weeks with about 3-6 months needed to correct this chemical imbalance. To find out more about this protocol see Mental Illness: The Nutrition Connection, a book by Prof. Carl Pfeiffer. Our Laboratory produces a comprehensive Histadelia Treatment Capsules used to specifically treat undermethylation according to Pfeiffers protocols. It contains high doses and uses the most bioavailable forms of these nutrients to maximize absorption. We also produce a cheaper but less comprehensive combination called undermethylator capsules which are both available online through the members section of this website. Alternatively if you also have pyroluria and high copper we also produce Primer Undermethylating Pyrole capsules to treat all three conditions. If you have histadelia and high copper levels (no pyroluria) we also have Primer Undermethylating capsules available.